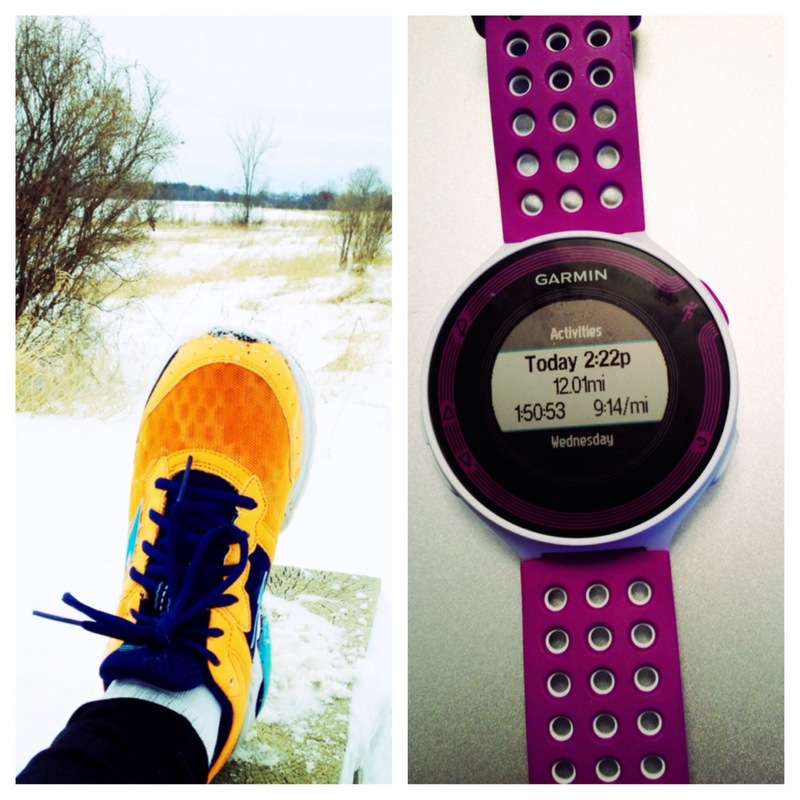 My love for Garmin Forerunner’s began while training for my first marathon in 2008. As my mileage increased I quickly found it was super annoying to plot my running routes in advance so I knew how far I was running. I also didn’t enjoy using a simple wrist watch as knowing my time didn’t exactly tell me my pace. I had a goal of running a marathon in under four hours, and I felt I really had no idea how my runs were going in terms of pace. 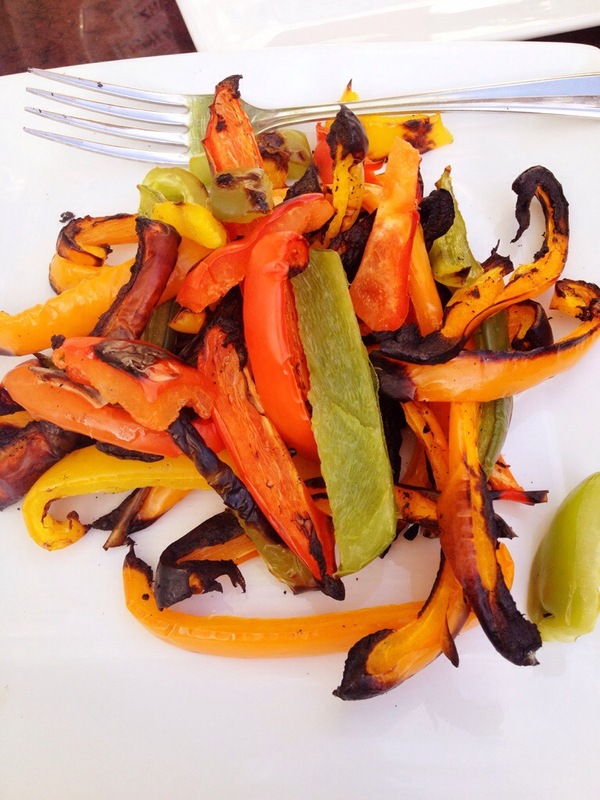 It is hard to stick to a goal without the data to give you feedback. Despite this I didn’t buy a Garmin right away. I felt like I wasn’t a serious enough runner to buy such an expensive and advanced watch. 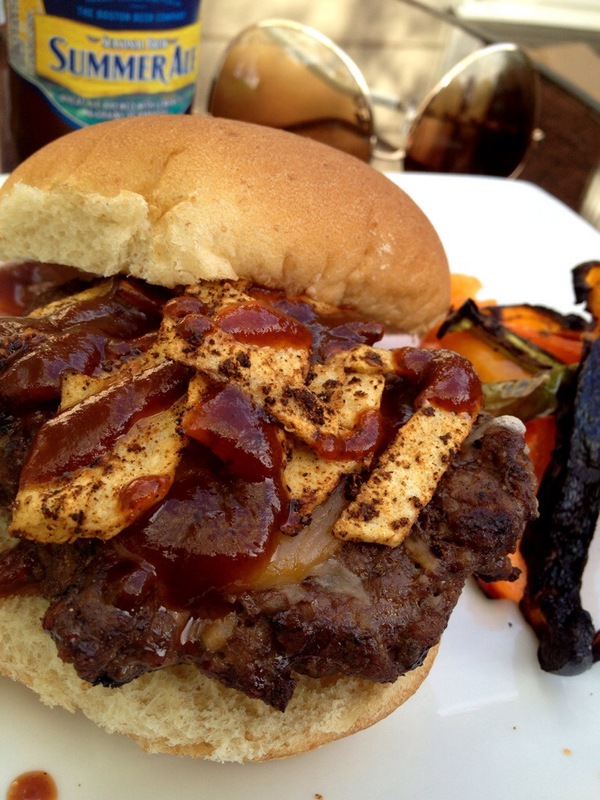 Eventually I caved, and I was SO glad I did. 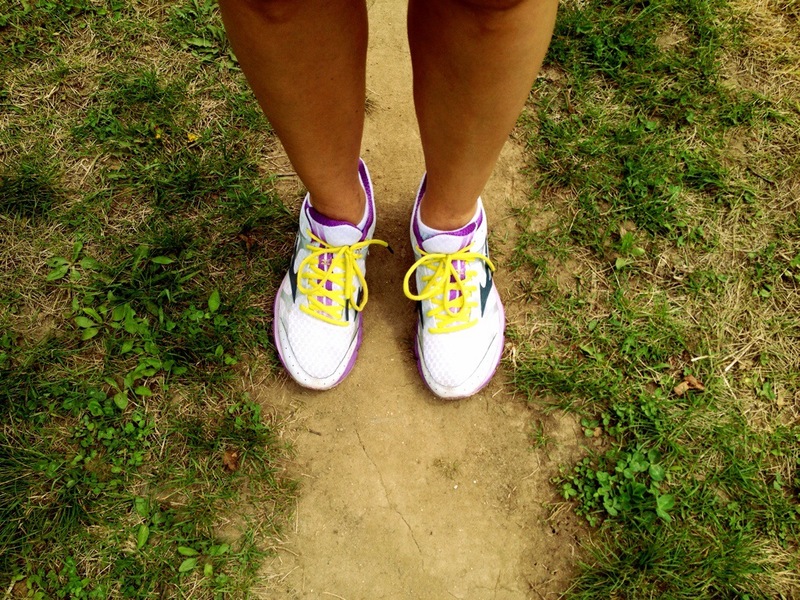 What does it mean to be a serious runner anyway? There is no set mileage or qualifying pace we need to run. If you run, then you are a runner. Seriously! The Garmin Forerunner 301 I purchased in 2008 served me well. In fact it still worked when my husband bought me a new one, but I was having troubles charging it. Sometimes it would not charge or would randomly turn on during charging instead of actually charging leaving me to find a dead Garmin and made me an unhappy runner. After using ponytail holders to position the charging cord just right too many times, I professed my need for a new watch. The only problem-while I love having the latest technology, I also find it super wasteful to always buy the newest model when the older version works fine. I didn’t want to spend my money on a new watch. Lucky for me the husband does listen to me when I’m talking (most of the time), and he surprised me with a new watch for Christmas. Recently I was asked some questions about the watch, so I decided to finally do a review of the watch. I don’t like reading reviews of something technology related when the user has only had the product for a short time. After using the watch on most runs for the past six months, I feel I am ready to review it for others to decide if it is the right watch for them. I consider the Garmin Forerunner 220 to be the perfect watch for most runners who do not race competitively or for money. The Garmin Forerunner 620 has some amazing features, but in reality most runners will not use these features making the $450 price tag steep. 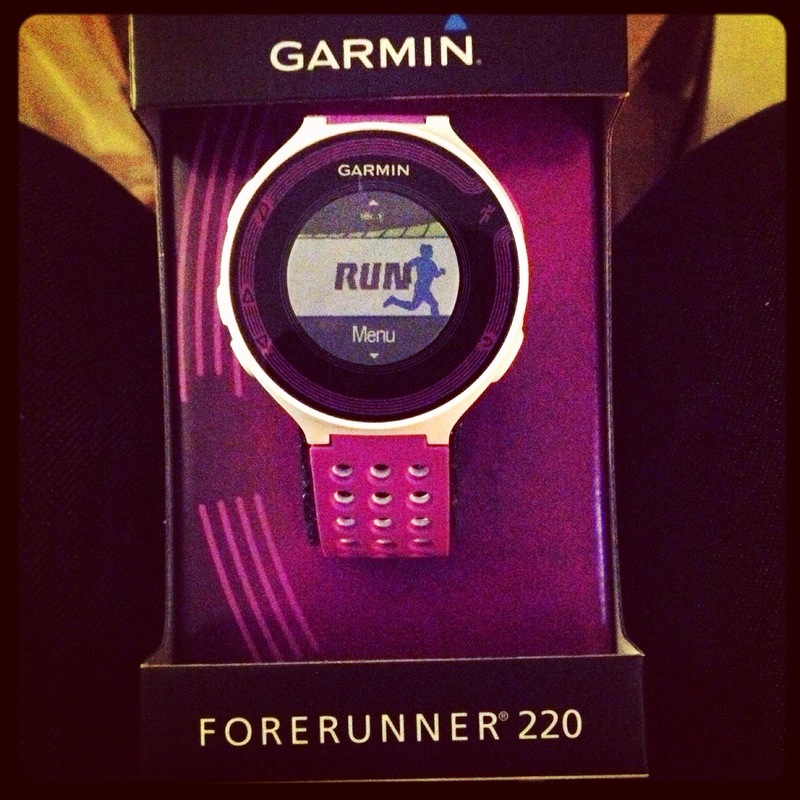 The 220 is much more reasonable coming in at $250 with a heart rate monitor. 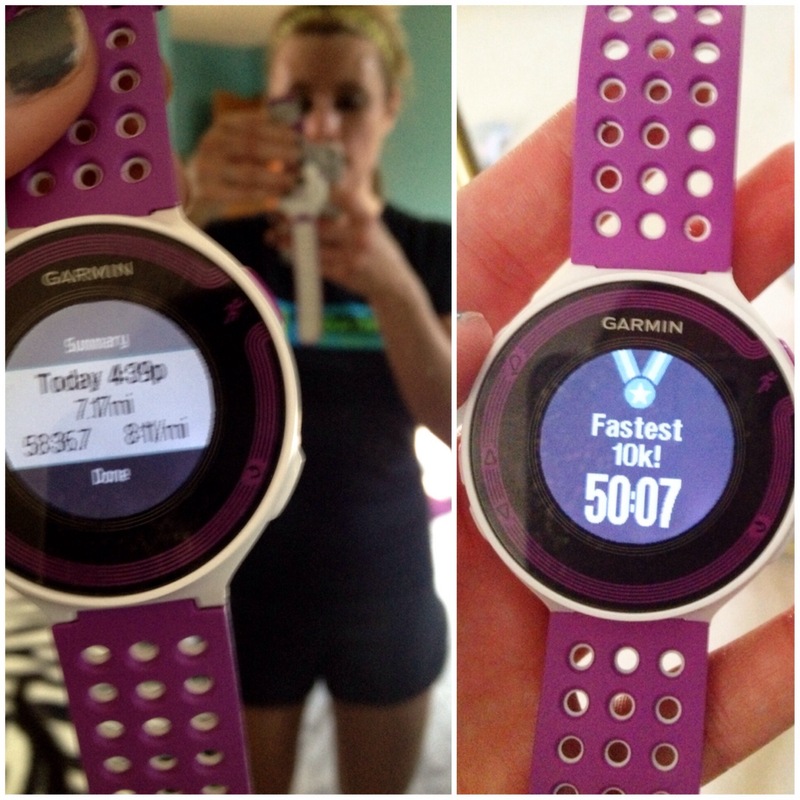 Since the main purpose of this watch is to track distance and pace this is sort of important to a runner. I’ve found that after running in the same location for a couple of runs, the 220 will recognize where you are and will take only a minute or less to load satellites for you to be ready to run. Each time you travel more than 30 miles away from your “home” location or previous route plan for the Garmin to take a few extra minutes to recognize where you are and load satellites. Annoying? Yes. Dealbreaker-No! Again, if you tend to run in the same area for your runs (which I usually do) then this isn’t too much of an issue. In terms of accurate distance measurement the 220 is on par with other GPS watches and apps. When running with both my Runkeeper app and the 220 to compare they do not always register the same mileage, but neither do both the Forerunner 220 and 301. This is actually common with many GPS devices and the disparities between devices tend to be rather insignificant (as in tenths of a mile). 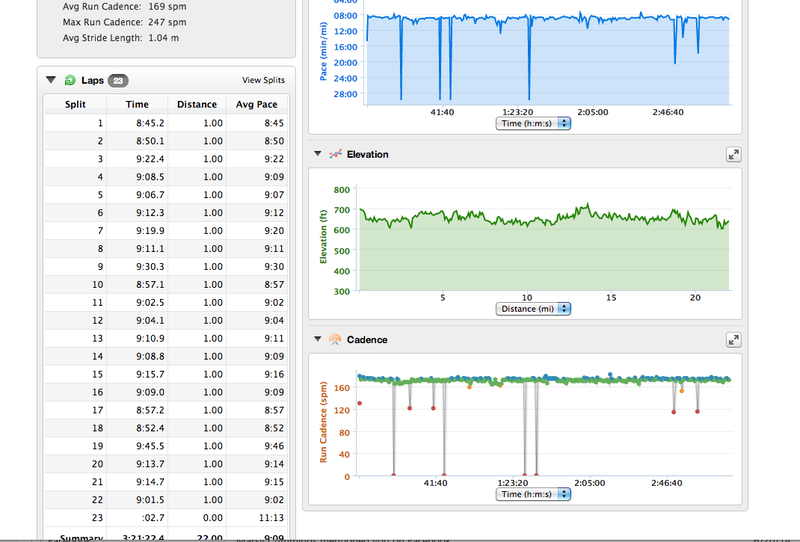 Running routes I’d mapped out prior to using the 220 seem to measure the same distance with the 220. I’ve never had the Garmin drop a signal or quit working while running. The only exception is of course when you go where GPS can’t reach as in through a tunnel, under a long bridge, etc. No watch or app will be able to help you in those conditions. My 220 lasts for 10-15 hours of actual running time. You can wear the watch while not in GPS mode and it will last for a week or so. This is solid battery time and it recharges very quickly (in a matter of a couple of hours). 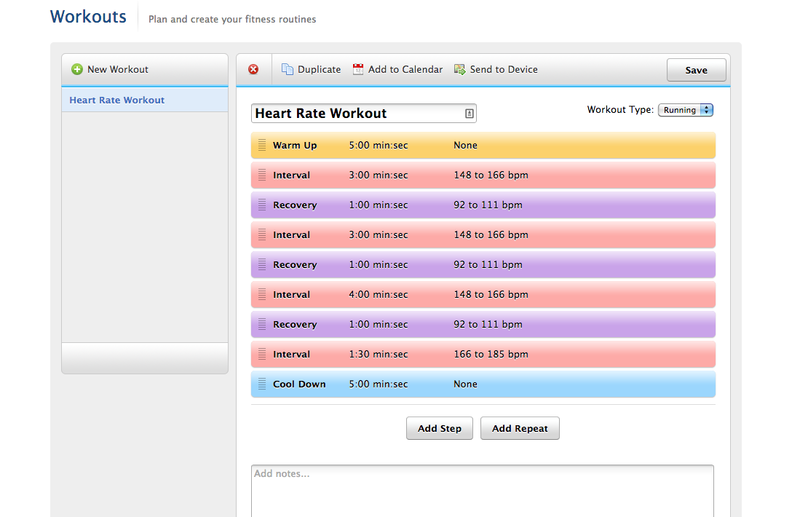 Under the training tab on the 220 are three useful features: My Workouts, Training Calendar and Intervals. 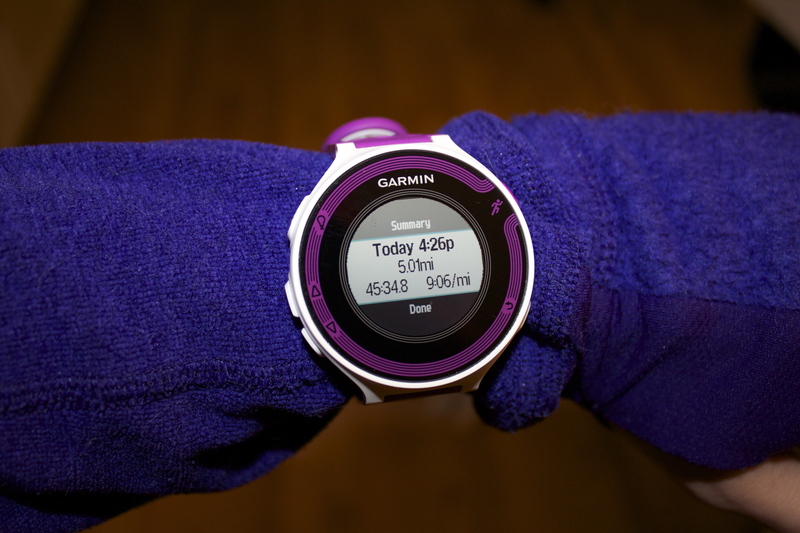 My Workouts allows the runner to create a Garmin Connect account online (can be synced to the app for your phone, too) and download specific workouts you’ve selected or created yourself like the one above to your watch. Once you’ve selected workouts you can run them and track your results on your watch which can be synced to your phone and online account. Training Calendar allows runners to create just that and have it sync to your watch. Intervals allows you to create interval workouts such as 4×1 mile with 1:00 rest. 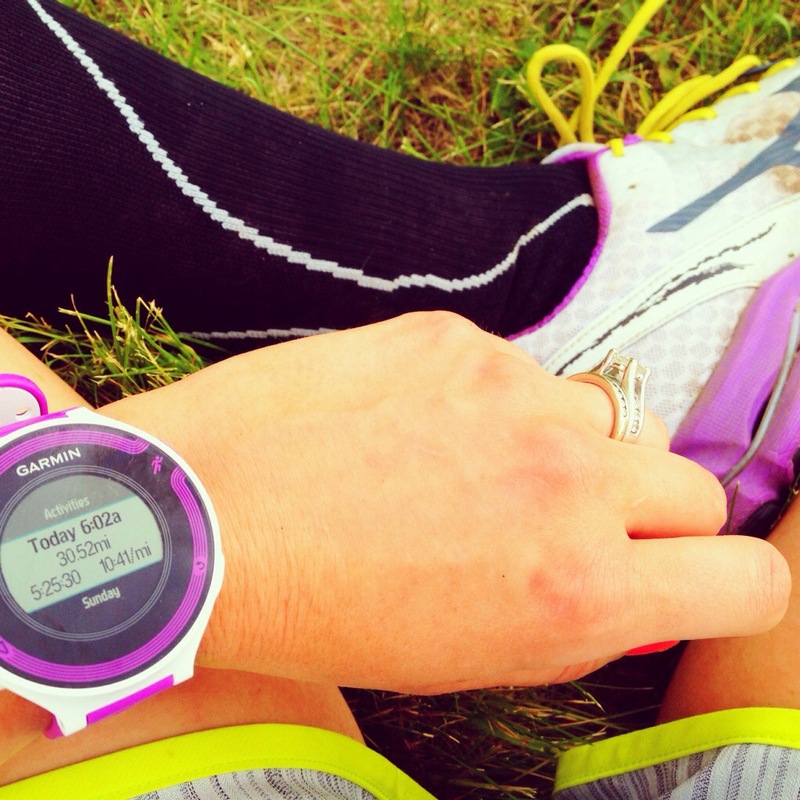 The watch keeps track of your run and rest times and alerts you to run and rest. Intervals are editable so you can change them to any distance, number or rest time you want. Keeps track of your activities by date and lets you review your pace, time, distance, calories, cadence and heart rate for each activity. It also tracks your laps which defaults as one mile, but could be changed. 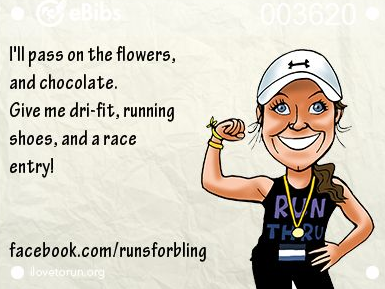 Totals are also kept track of here where you can review your weekly and monthly miles and total time spent running. Records for times and specific distances (1 mile, 5k, 10k, half, marathon and longest run) are kept under this section. You can also add sensors and use bluetooth to connect your mobile device to your watch so all your workout data syncs to the Garmin Connect app. I have not been able to successfully do this after repeated attempts, so I simply use the online Garmin Connect and not the app. Other settings include creating alert tones, turning vibrations on and off (I love the vibrations at each mile) and setting an alarm with this watch. Garmin Connect is where all your data is stored online. Honestly every piece of data you could imagine wanting to see is all there. 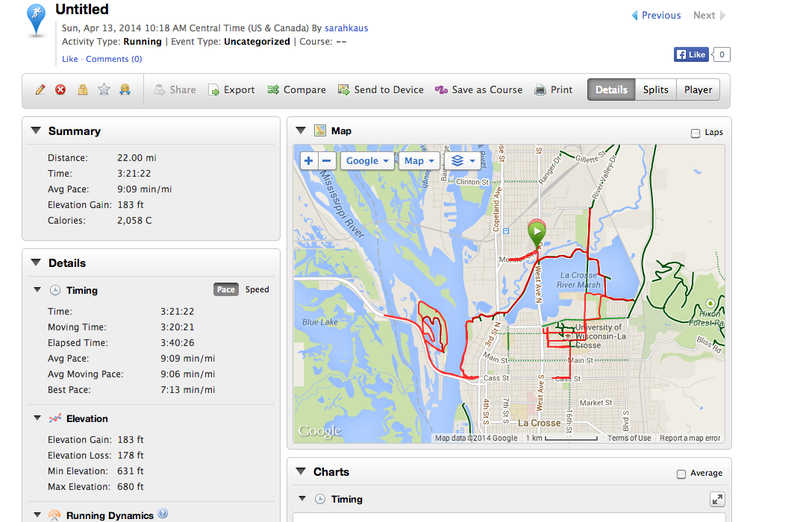 See below from a long run I did this spring. 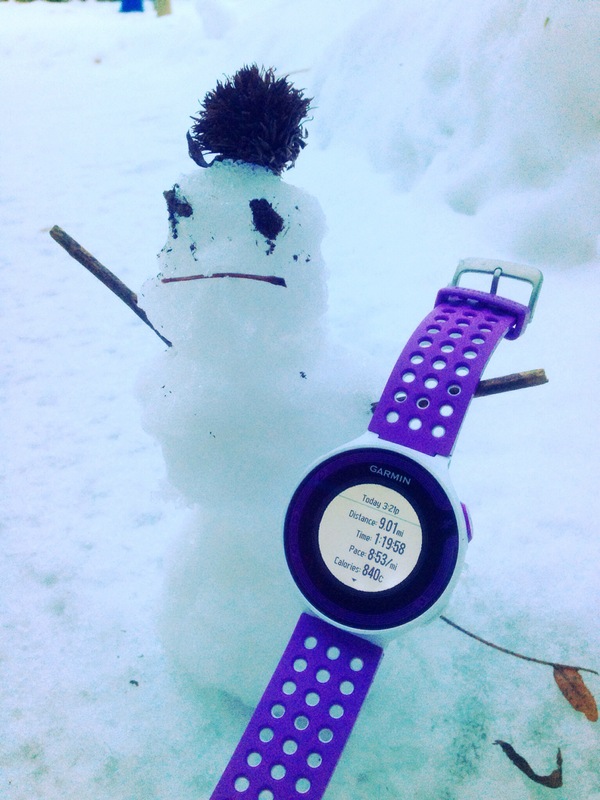 I’ve run with this watch in the cold (windchills of minus 12 and actual temps below zero), in the heat (90 degrees plus), in the humidity and in the rain. I’ve used the 220 in races from half marathons to a 50k. I love that the 220 has a plastic wristband with holes making it easy to clean and way less smelly than the fabric band of the Forerunner 301. Imagine 5.5 years of sweat all in one strap that can’t be removed from its electronic device-or don’t because it’s pretty nasty. The purple color is super cute and the size is appropriate even for those ladies who have smaller wrists. The wrist band can also accommodate a wide range of wrist sizes and still be comfortable. Ryan has worn the watch too and attests to its comfort and fit for a guy. Even considering all of these features some of you are probably still unsure. Now that running apps are available to track similar data for free some wonder why would you want to purchase a GPS running watch? The reasons are actually pretty strong. In my experience it can be annoying toggling between songs and your running app while running, and I often need to stop running to go back into my music or my running app for data or to change a song. If this isn’t a problem, then the whole battery thing is. My iPhone never makes it tracking a run of more than 17 miles while using RunKeeper alone even when all other apps are closed and it is fully charged. That means no picture taking or music on the run either. 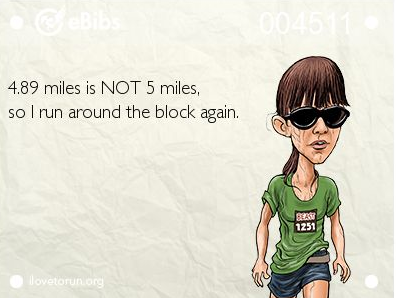 That is so not cool during a long run or marathon. I should know as it happened to me during the Chicago Marathon a couple of years ago. Mile 17=dead iPhone and kill the music and knowing your pace. Good thing I loved that marathon course and all the fans! Another battery killer-runs in the cold. My iPhone does not last long in the cold. Another bad combination-iPhones and rain. In remote areas my iPhone sometimes doesn’t find my location as well as my Garmin 220. Finally, Runkeeper simply doesn’t have all the features (alerts, training calendars, heart rate workouts,etc) my Garmin does. I do use RunKeeper on shorter runs and to track mileage, but it is just easier and more efficient to use my Garmin 220 on a regular basis. 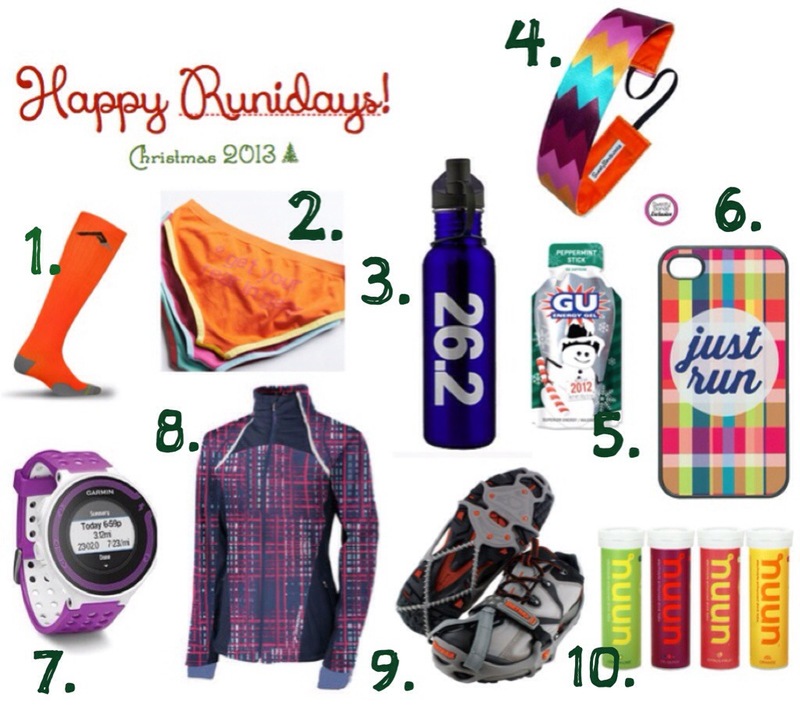 This also makes a happier runner! The Garmin Forerunner 220 is seriously one of my favorite (if not my favorite) running accessories ever. I even find myself wearing it just for fun. If you are on the fence about the watch, I encourage you to think about how often you will use the watch and how long the watch lasts if taken care of (my last Garmin Forerunner lasted 5.5 years.) Divide the cost by miles or time spent wearing it and decide if it is worth it to you. I know it was for me. 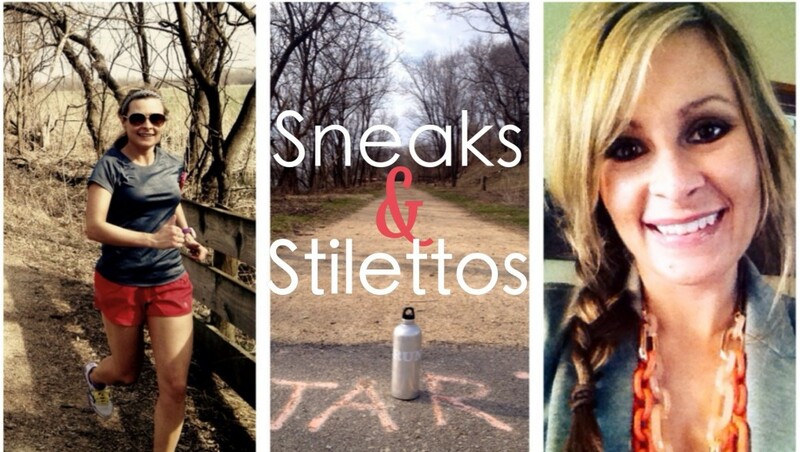 And what else do runners love to take pictures of besides their sneakered feet? You guessed it! Their GPS watches with their running stats! Hope this helps anyone out there thinking about whether or not a Garmin Forerunner 220 is for them! Disclaimer: All opinions are my own and I was not compensated in any way for this post.